Rabbit recombinant monoclonal IKK alpha + IKK beta antibody [EPR16628]. Validated in WB, IP, Flow Cyt, ICC/IF and tested in Mouse, Rat, Human. Cited in 6 publication(s). Recombinant fragment within Human IKK alpha + IKK beta aa 450 to the C-terminus. The exact sequence is proprietary. WB: HeLa, Daudi, HL-60, A431, 293T, C6, Raw264.7 and NIH/3T3 whole cell lysates. Human fetal kidney lysates. Mouse brain, Mouse kidney, Mouse spleen and Rat kidney lysates. ICC/IF: HeLa cells. IP: Jurkat whole cell extract. Our Abpromise guarantee covers the use of ab178870 in the following tested applications. WB 1/1000. Detects a band of approximately 75, 87 kDa (predicted molecular weight: 85, 87 kDa). IKK is a serine protein kinase, and the IKK complex contains alpha and beta subunits (IKK alpha and IKK beta). IKK alpha and IKK beta interact with each other and both are essential for NFkB activation. Cytoplasmic and Nuclear; Membrane raft. Note: IKK beta is colocalized with DPP4 in membrane rafts. Immunofluorescent analysis of 4% paraformaldehyde-fixed, 0.1% tritonX-100 permeabilized HeLa (Human epithelial cells from cervix adenocarcinoma) cells labeling IKK alpha + IKK beta with ab178870 at 1/50 dilution, followed by Goat anti rabbit IgG (Alexa Fluor® 488) secondary antibody (ab150077) at 1/200 dilution (green). Nuclear and cytoplasm staining is detected. Tubulin is detected with Mouse anti-Tubulin antibody (ab7291) at 1/500 dilution and ab150120 (AlexaFluor®594 Goat anti-Mouse secondary) at 1/400 dilution (red). The nuclear counter stain is DAPI (blue). -ve control 1 - ab178870 at 1/50 diltuion followed by Goat anti mouse IgG (Alexa Fluor®594) at 1/400 dilution. -ve control 2 - Mouse anti-Tubulin antibody (ab7291) at 1/500 dilution followed by Goat anti rabbit IgG (Alexa Fluor®488) at 1/200 dilution. ab178870 could recognize 3 isoforms of IKK beta with the MWs of 87kDa, 86kDa and 80kDa, respectively. It could also recognize IKK alpha. Flow Cytometry analysis of HeLa (human cervix adenocarcinoma) cells labeling IKK alpha + IKK beta with purified ab178870 at 1/130 dilution(10ug/ml) (red). Cells were fixed with 4% paraformaldehyde and permeabilised with 90% methanol. A Goat anti rabbit IgG (Alexa Fluor® 488)(1/2000 dilution) was used as the secondary antibody. Rabbit monoclonal IgG (Black) was used as the isotype control, cells without incubation with primary antibody and secondary antibody (Blue) was used as the unlabeled control. Observed band size: 75,87 kDa why is the actual band size different from the predicted? Immunoprecipitation of Jurkat (Human T cell leukemia cells from peripheral blood) whole cell extracts using ab178870 at 1/40 dilution. Western blot detection was performed using ab178870 at 1/1000 dilution followed by Goat Anti-Rabbit IgG, (H+L), Peroxidase conjugated secondary antibody at 1/1000 dilution. The blocking and diluting buffer was 5% NFDM/TBST. Cross-Immunoprecipitation of Jurkat (Human T cell leukemia cells from peripheral blood) whole cell extracts using ab178870 at 1/40 dilution. Western blot detection was performed using ab32041 (IKK alpha) at 1/1000 dilution followed by Goat Anti-Rabbit IgG, (H+L), Peroxidase conjugated secondary antibody at 1/1000 dilution. The blocking and diluting buffer was 5% NFDM/TBST. This immunofluorescent analysis of 4% paraformaldehyde-fixed, 0.1% triton-100 permeabilized HeLa (Human epithelial cells from cervix adenocarcinoma) cells is a comparison between ab178870 and a competitor’s leading rabbit polyclonal antibody. Labeling of IKK alpha + IKK beta with ab178870 is conducted at 1/50 dilution, followed by Goat Anti-Rabbit IgG (Alexa Fluor® 488) secondary antibody (ab150077) at 1/200 dilution. Labeling of IKK alpha + IKK beta with the competitor antibody is conducted at 1/40 dilution, followed by Goat Anti-Rabbit IgG (Alexa Fluor ® 488) at 1/200 dilution. This western blot image is a comparison of ab178870 against a competitor's leading rabbit polyclonal antibody. This western blot image is a comparison between ab178870 and a competitor's leading rabbit polyclonal antibody. 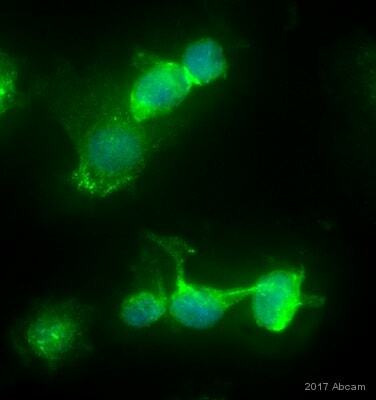 This immunoprecipation image is a comparison between ab178870 and a competitor's leading rabbit polyclonal antibody. Immunoprecipitation of Jurkat (Human T cell leukemia cells from peripheral blood) whole cell extracts using competitor’s Anti-IKK alpha + IKK beta rabbit polyclonal antibody at 1/12 dilution. Western blot detection was performed using competitor antibody at 1/100 dilution followed by Goat Anti-Rabbit IgG, (H+L), Peroxidase conjugated secondary antibody at 1/100 dilution. The blocking and diluting buffer was 5% NFDM/TBST. Publishing research using ab178870? Please let us know so that we can cite the reference in this datasheet.